I was saddened to learn of the death of Francis Peay, the head football coach at Northwestern when I went there back in the late 1980s. He was 69 years old, meaning he was about as old as I am now back when he was coaching the Wildcats. And so it goes. Rules of courtesy say that if you can’t say anything nice, don’t say anything at all. Fine.” And what followed was the entire column length in white space. It looked strange, but it made the point about how frustrating it was to be the laughingstock of the Big Ten (back when it really had ten teams). But I’m sure that he was trying his best, even if the results weren’t what we wanted. Coach Peay (pronounced “PAY”) was replaced by Gary Barnett in 1992, and things have improved markedly since then. They had to, really, because it had fallen so far by then. That sportswriter couldn’t say anything nice about the football team back in 1989, but I’ll say something nice about Francis Peay. Coaching a football team–even a bad one–can’t be an easy thing, and the fact that he had a chance to do it in the first place is quite a feather in his cap. Time marches on, and the marshmallow fights that we had in the student section during those games, in order to divert our attention from the bad things happening on the field, are now a thing of the past. But they are moments in time, all the same, and Coach Peay deserves credit for doing a difficult job in a difficult place. May he rest in peace. 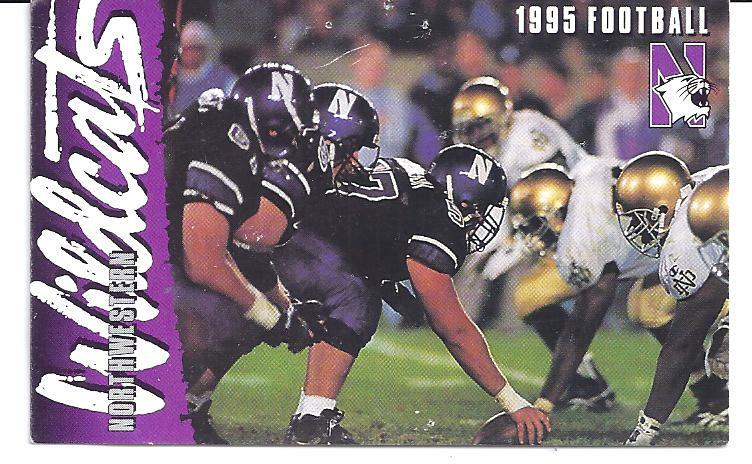 Mine wasn’t the first undergraduate class to experience a winless football season at Northwestern, when they went 0-11 during my senior year of 1989. The team was also winless in 1978, 1980, and 1981, and just missed it in 1977 and 1979, as well. 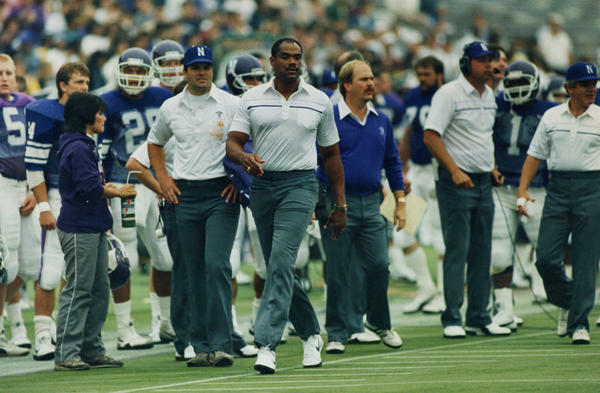 The late 1970s and early 1980s seem to be the true dark ages for Northwestern football. In fact, the very first game I went to as a freshman, in the fall of 1986, was a victory over Army. This won’t be so bad, I thought to myself. But eventually, it did become that bad. The last game that I witnessed on campus was a 63-14 loss to Illinois in 1989, which put the finishing touches on the type of season that Northwestern will hopefully never see again. So when the team starts out this year at 2-0, and has a ranking in the 16-17 range of the weekly polls, it feels pretty good. I always have been, and always will be, proud of my alma mater for reasons that have nothing to do with football. But having been on the other end of the spectrum before, I intend to enjoy this season–and all the other seasons that Pat Fitzgerald is around–as thoroughly as I can. Fireworks and pyrotechnics; two fine-looking dancing women; jaw-dropping guitar work; a marching band; some shadowy images of Prince’s, should we say, unique guitar; and a hypnotic, show-stopping finale; all against the backdrop of a healthy rainstorm. In short, Purple Rain was performed in the purple rain. How does it get better than that? Since watching this performance again online, Purple Rain has been stuck inside my head for nearly a week. And it was against this mental soundtrack that Northwestern University and the Chicago Cubs announced a partnership that will significantly raise the profile of both parties in the years ahead. 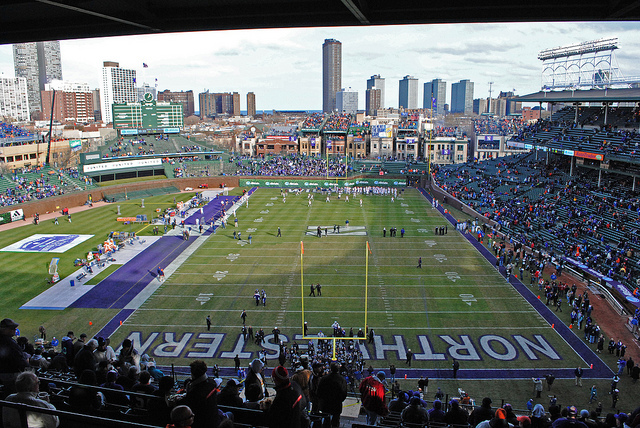 It certainly points toward some very good things in the near future..
Northwestern could never build a 75,000 seat football stadium on Chicago’s North Shore. The neighbors wouldn’t stand for it, and the Wildcats’ fan base, as supportive as it is, sometimes struggles to fill up the 50,000 seats of Ryan Field. 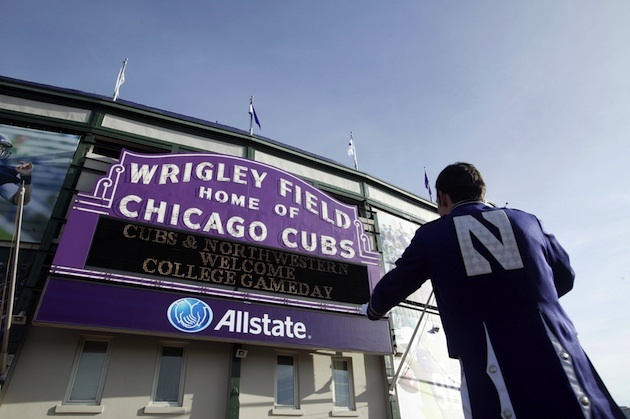 But who needs to do that, now that the Cats have access to iconic Wrigley Field? And don’t think that this recruiting tool is going to go unused, either. What high school prospect–when faced with making the biggest decision of his young life–won’t jump at the chance to step onto the field at Clark and Addison? And who among us wouldn’t do the same thing, if we had that chance? This arrangement, along with with the new sports facility being planned along the lakefront on Northwestern’s campus, is a sure sign that Northwestern coach Pat Fitzgerald isn’t going anywhere. That’s going to be another huge advantage Northwestern will have in recruiting during the years ahead. When Notre Dame gets back to work next summer–seeking to quickly get to Manti Who?–they will be dogged by questions about Brian Kelly’s future. He’s already interviewed with an NFL team, after steadily rising through the coaching ranks in college. It’s naïve to think that he’ll be at Notre Dame long term. From watching how the annual Gary Barnett Soap Opera played out in the late 1990s, I can confidently say that one or two years of that will be more than enough for anyone in South Bend. Bret Bielema, who seemed to be Wisconsin’s coach for the foreseeable future, has flown the coop in Madison for the greener pastures of the SEC. Urban Meyer, who will have National Championship pressures for however long he’ll be at Ohio State, is something of a coaching nomad, himself. And then there’s Coach Fitz. You may recall how he first put Northwestern’s football program back on the map, as a player back in the 1990s. As an alumnus, and a tireless ambassador for the school and the program that he has built, he has the unwavering support of the University, the Athletic Department, and the student body. There’s no chance of him leaving anytime soon, and that stability means everything for teenagers who don’t want the rug pulled out from under them. That’s exactly what happens, whenever a head coach moves on to someplace else. It’s taken several years, and many disappointments, but things are now falling into place very quickly for Northwestern football. With a bowl victory, a loaded team coming back in the Fall, a respected head coach, a new training facility on the drawing board, and an arrangement to play in Wrigley Field in the future, a golden age of Wildcat football seems to be just a few months away. It could even end up as a Purple reign. 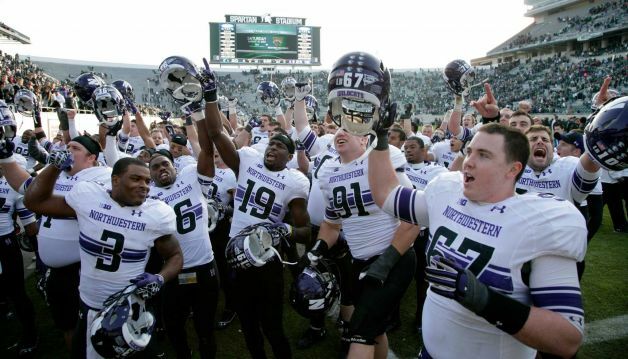 Northwestern won its first bowl game of my lifetime today, in a rather convincing fashion. They beat Mississippi State 34-20 in the Gator Bowl (I’m not using the corporate sponsor’s name here) to get the new year off to a winning start. The monkey has been sent away, the streak has been broken, and any other appropriate metaphors are no longer relevant. 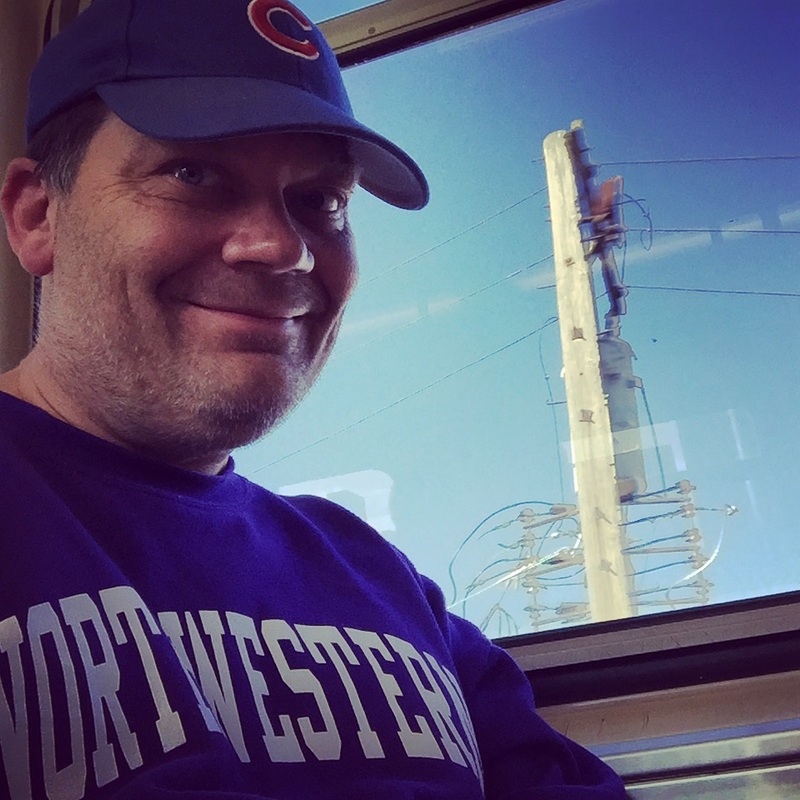 Those who think 13 is unlucky–and I have professed myself to be one of them, in a different context–should talk to Northwestern fans tonight, because thirteen’s just fine with us right now. So now it’s onward to bigger and better things in the fall. Most of the main players are coming back next year, especially on offense, so why not think that the Big Ten championship and a BCS bowl berth are possible? At this moment, anything and everything seems reasonable to me. This morning, I pulled out my old Northwestern car flag and attached it to the window of my car for the drive into work. It’s New Year’s eve, and since NU has a game tomorrow morning against Mississippi State in the Gator Bowl, I wanted to display some Wildcat pride on the streets of Chicago. I’ve had the flag for probably fifteen years, meaning that it’s been flown many times before. 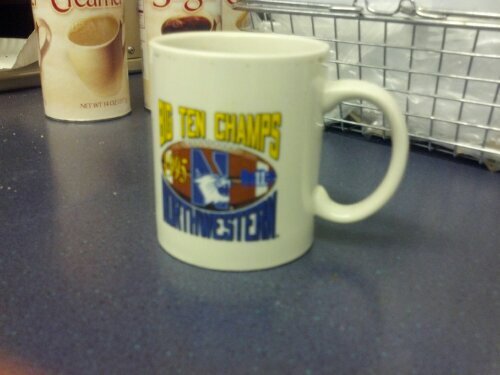 It’s known some good times over the years, but during bowl season there’s been only disappointment. Maybe that will change this year, I thought to myself as I drove toward the Kennedy Expressway and the suburban office where I work. Traffic was light, as might be expected on New Year’s Eve day. As I pulled onto the highway, things were looking great. That is, until I heard the noise. There was a loud slap against the roof of the car, followed by silence. The familiar ruffling sound of the flag as it hit the roof of my car was gone. I knew what the problem was but, since I was already on the highway, I couldn’t really do anything about it. And so I drove on, until I stopped at an oasis to check. Just as I had suspected, the plastic rings that had attached the car flag to the pole were no match for wind that was created by driving onto the highway. The rings had snapped, and the flag went off to its resting place, somewhere near the on-ramp to the highway. 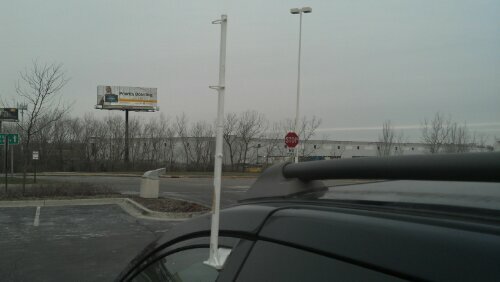 At first I was bummed out, and not because I had been driving with what resembled a Festivus pole on my car. No, I had had that flag for many, many years, and it was a link to days from the past that I’ll never see again. But what were those days, exactly? Usually a good performance by the Wildcats during the regular season, punctuated by disappointment at the end of the season, either by losing a bowl game, or by not playing in one at all. Perhaps, rather than being a bad thing, the loss of my flag is a sign of good things to come tomorrow morning. 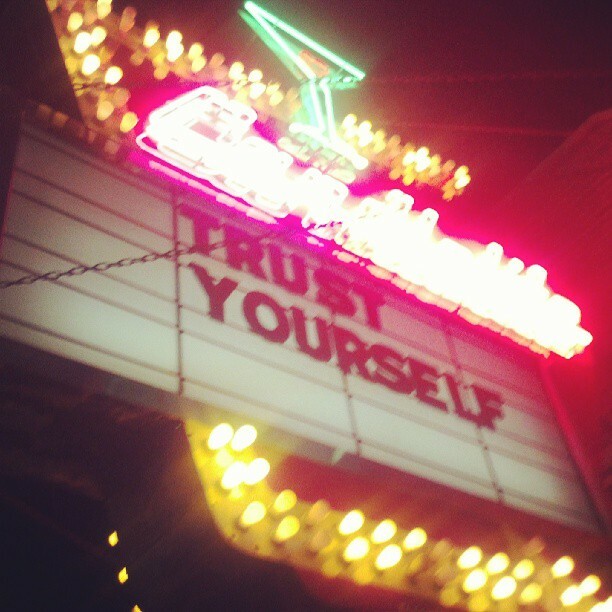 We’ll all find out soon enough. UPDATE: The loss of the flag was indeed a good sign, as Northwestern beat Mississippi State 34-20, to capture its first bowl win in a very long time. Expectations for this team in the fall will be very high, indeed. 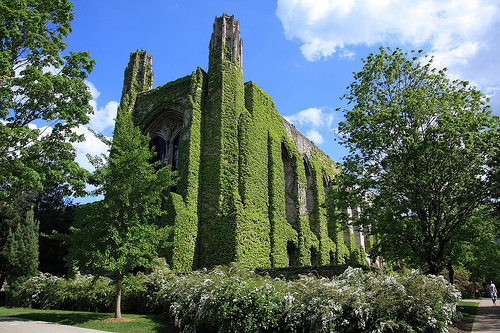 As somebody who graduated from what felt like Football High, it was a dramatic change to attend Northwestern in the late 1980s. The football team was terrible, so much so that we would literally throw marshmallows at each other during home games, in order to distract ourselves from what was transpiring on the field. And lots of people would snicker when I told them where I went to school. Never mind that it was a top flight academic school, then and now. The football team sucked and, in some people’s minds, that was more important. But who’s laughing now? Not only is the Northwestern football program among the top ones in the country on the field, but it’s ranked at the very top where it matters most: in the classroom. Colleges and universities are academic endeavors first, and sports programs second (at best). So to read that Northwestern bests all other schools in areas that matter like graduation rates, it’s enormously heartening. The best thing about this news is that no other school was even close. I will repeat that: Northwestern came out on top, comfortably ahead of every other school ranked in the Top 25 in the polls. So while the Wildcats won’t be playing in a BCS bowl game this year, they now have a recruiting chip that no other school can match, at least for the players and their families who give a fig about education. And that’s very gratifying for everyone affiliated with Northwestern. As much as anything else, this post is written to get the above picture of Northwestern football coach Pat Fitzgerald out onto the web. It was on the cover of a pocket schedule that I picked up at a game at Ryan Field earlier this season. The purple and white shading is a cool effect, but the look on Coach’s face says it all. This guy is a football coach who is–and will continue to be–the face of the program. I’m looking forward to many years of success in the future. Wherever the bowl game ends up being in a few weeks, a victory would be the 50th of his career. This would break a tie with Lynn “Pappy” Waldorf, who coached at NU back in the 1930s and 1940s before leaving for Cal. And the only college football coach who ever lost a bowl game to Northwestern is…..Pappy Waldorf, in the 1949 Rose Bowl. You can’t make this stuff up. Just in case a desire to finally get the bowl game monkey off of their backs wasn’t enough, Wildcat players have the added incentive of helping to put their coach into the university’s record books before the season ends. Every bit of motivation helps.